Hey lovelies! I have a special treat for you today! Check out this gorgeous hand-stamped sterling silver necklace created by Lauren Nicole Gifts! Lauren Nicole Gifts is a great place to find gorgeous hand-stamped jewelry and other unique and personalized gifts. Lauren Nicole Gifts specializes in custom, hand stamped, and monogrammed jewelry that is hand made just for you. Our original line of jewelry includes baby footprint and hand print necklaces, child's signature and artwork necklaces, and mommy jewelry. We have a unique collection of monogrammed, initial, and wax seal jewelry. 1. Wedding Charm Necklaces - a beautiful way to celebrate that special day! 2. Mommy Necklaces - a perfect Mother's day gift! 3. Handprint Cuff-links for Dad - use your child's actual hand prints! 4. Children's Artwork Jewelry - made with your child's original artwork! I was so excited to get my very own twitter handle necklace in the mail, especially after seeing a few at BlogHer in August. It arrived in a cute little box and included a bonus Jewelry cleaning cloth. I really couldn't wait to put it on after it arrived. I love the chain, it's honestly the perfect length for me. It has a delicate, high quality, look and feel to it. Hand Stamped Sterling Silver Twitter Handle Necklace - The solid sterling silver pendant measures 3/4" to 1.25" long depending on the length of the name. The pendant can be hand stamped with up to 16 characters (punctuation, dots and spaces count as characters). The charm comes on a sterling silver chain with a freshwater pearl charm (the pearl can be upgraded to a gemstone - gemstones may vary in shape depending on what we have in stock). I received a complimentary necklace from Lauren Nicole Gifts to review via ThetaMom, as always all opinions expressed in this review are my own. I would get a twitter neclace as well!! Super cute!!! Love the child's artwork ring! What a great idea and fun thing to do with their artwork! The wax seal necklaces are pretty cool! I so want a Twitter handle necklace! Hey there! New follower here! Excited to be following along! I love the graffiti hand stamped necklace! Super cute! These are beautiful! I think I would definitely get the twitter handle necklace for myself but I know my best friend would love something with her little boy (my god sons) hand prints on! the twitter necklace is do original! I like the twitter handle necklace too! I think i'd go for that! Thanks for the giveaway courtney! I love the hand stamped circle of love necklaces! Would be so cute to have a twitter handle necklace! I'd choose a personalized wedding/anniversary necklace. i love the handstamped name necklace! I LOVE the little footprint. It's a bonus to get the birthstone and name on it as well. So cute. i love all of it but the idea of the twitter handle is super cute. I would get the charm necklace! I would choose something from the hand stamped sterling silver necklaces. I'd like my sister's name and the day that she passed, with the little pearl Thanks for the chance to win! I would love one of the handstamped name necklaces!! So cute!! I would get the Monogramed & Teardrop necklace! i love the handstamped circle of love necklace! Handstampped mommy necklace. They are all so nice, making it hard to decide! 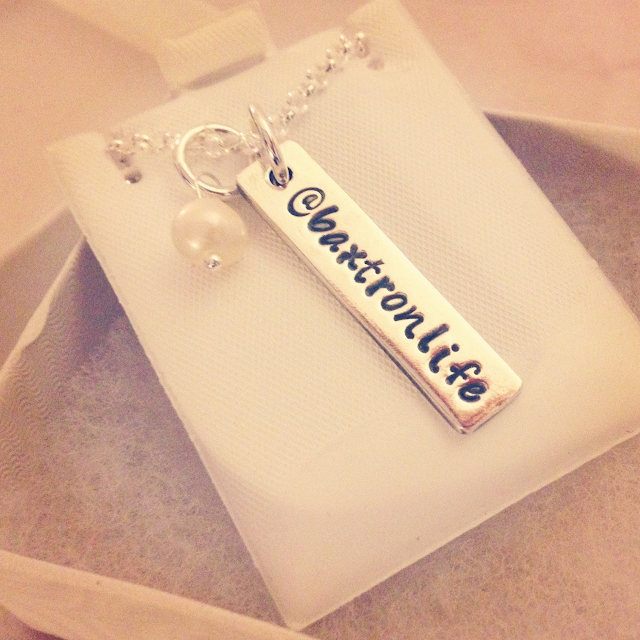 I'm in love with the twitter handle necklace! Such a cute idea! 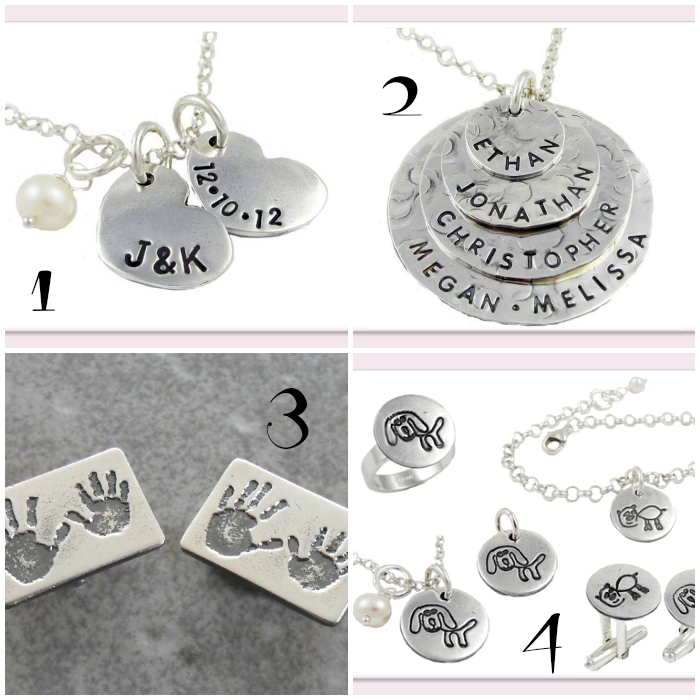 LOVE the handprint charms...and the wrap around bracelets! I'd probably get the twitter handle necklace. too cute! I like the monogrammed badge reels! I'd get the Aluminum Cuff Bracelet (http://www.laurennicolegifts.com/rings.html) and the Monogram Leather Wrap Around Bracelet (http://www.laurennicolegifts.com/viwrbr.html) soooo cute!! I really love your Name Necklace and I like it to gift the most special person of my life, my mother. Thanks.